OC launches new wetlands project! Wetlands have become a focus of interest worldwide recently, not only because of their ecological importance but also because the climate crisis has reminded us of these ecosystems’ capabilities for mitigation and adaptation to climate change. But why should we all turn our eyes to these wet, swampy, mosquito-infested areas? The answer is simple: protecting wetlands is a very smart environmental and economic decision. In the United States alone, the associated ecosystem services of these areas have been estimated at US$14 trillion annually (Russi et al 2013). Wetlands hold the potential of not only protecting wildlife and biodiversity, but also of keeping traditional livelihoods, mitigating carbon emissions, adapting communities to climate change and protecting natural water sources. Let’s have a look at the definition of a wetland – after all, most of us can’t really tell what a ‘wetland’ is, and its definition has proven to be complicated on a practical basis. According to the Ramsar Convention on Wetlands, a wetland can be defined as “areas of marsh, fern, peatland or water, whether natural or artificial, permanent or temporary, with water that is static or flowing, fresh, brackish or salt, including areas of marine water of which the depth at low tide does not exceed six meters”. So basically, every single water related space could potentially be a wetland, including coral reefs, rivers, lagoons, aquiculture farms, rice paddies, mangroves and so on and so forth. This broad definition creates both opportunities and limitations – under that logic, an abandoned pool in the middle of a recovering land can even be qualified as a wetland. With these limitations in mind, protecting wetlands can generate a challenge when you have to settle the different interests of communities and people with those of conservation. Keeping this tricky, broad definition in mind, it is of upmost importance to understand that wetland ecosystems are also cultural landscapes. Ramsar Convention, the world’s leading authority on the matter, recognizes these areas as combined works of nature and humankind that express a long and intimate relationship between people and their natural environment (Gland, 2008). Denying this approach can be lethal for many wetlands in the world, whilst embracing it can bring an effective model into place, one of community self-management. 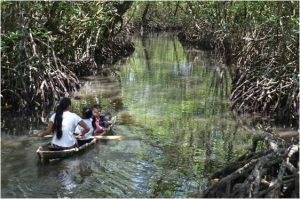 In Costa Rica, while managing a wetland, approaching communities living inside the wetland is unavoidable, especially in protected areas. 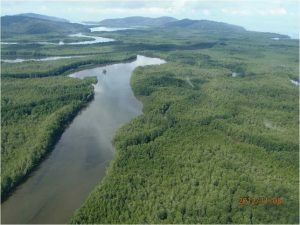 Under these conditions, new socio- environmental opportunities are created where government, organizations, companies and communities can work together towards non-traditional models of conservation, where people have the opportunity to rise up to the challenge of protecting and using these cultural landscapes on self-management based models. At Osa Conservation we believe that in order to keep biodiversity functional we need to come up with new models of conservation that balance the needs of ecosystem users and the species that live within them. 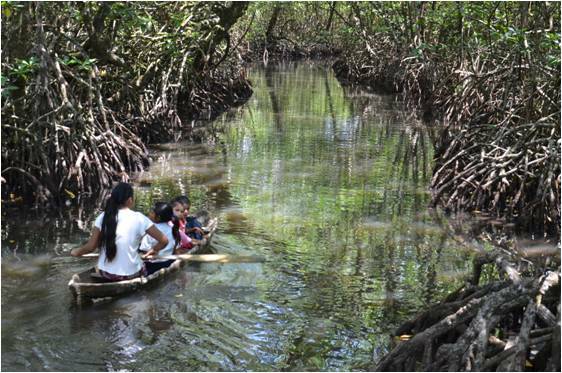 With the wetland program the organization aims to work with the authorities and local peoples to protect these ecosystems, where managing these areas becomes a socio-environmental challenge, but even more importantly as an opportunity. Follow our blog so you can find out more about the new program and the specific projects. In following posts we will be updating on the Terraba Sierpe Wetland Project, where we aim to bring this socio-environmental opportunity to a practical reality. This entry was posted in Land Conservation and Forest Restoration, Marine Conservation, Science and Research. Bookmark the permalink.